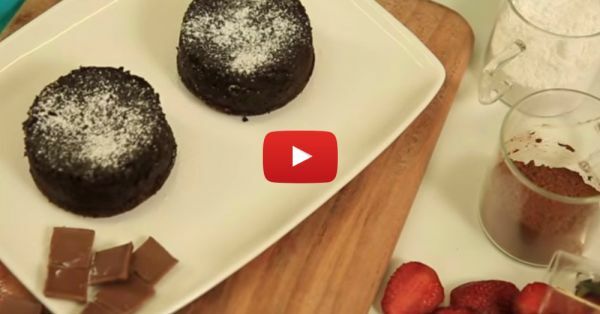 How To Make Domino’s Style Choco Lava Cake At Home! There’s nothing better than a yummy piece of chocolate cake! We’re sure you too can’t thank Domino’s enough for the choco lava cake shaped happiness it has blessed us with! The melt-in-mouth molten chocolate oozing all over your spoon, and flushing through all corners of your mouth is pure heaven, right? Here’s how you can make the chocolatey wonder, whenever you want! - Melt chocolate over a double boiler until smooth. Let it cool. - Grease your ramekins with butter and dust with sugar or cocoa powder. Keep aside. Preheat oven to 200 C.
- In a large bowl, cream together butter, sugar and vanilla essence until well combined and creamy. - Add eggs, beating well after each addition. - Add in the flour and mix until combined properly. - Lastly, add in the cooled chocolate and give it a good stir. - Pour the batter into the ramekins and bake for 12 mins. - Let it cool for 5 mins before de-moulding. Run a knife around the sides of the ramekin and slowly de-mould on a plate. Sprinkle with icing sugar. Serve hot with a scoop of ice cream. Don’t forget to subscribe to POPxo Yum here.